Although the game of football as we know it today supposedly dates back to the nineteenth century, there is some evidence to support that the ancient Greeks played a version of football they called harpaston. This game apparently took place on a rectangular field with goal lines on both ends. Two teams of equal number, but varying player size, were divided by a center line. The game began by throwing the harpaston or handball into the air. The object of the game was to pass, kick, or run the ball past the opposing team's goal line. The game next took to the streets. Participants from neighboring towns would meet at a designated point. Still without official rules or methods of keeping score, the bladder or ball would be kicked through the streets. This took place until protests from local shopkeepers forced players to confine their game to a vacant area. It is here that the rules of the game first took shape. A field much like that used to play soccer was marked with boundaries. The team that kicked the ball over the opponent' s goal line was awarded one point. It also was at this time that the game took on the name of futballe. The game remained strictly a kicking game until American collegians blended soccer with rugby. In 1874, McGill University (Montreal, Canada) engaged Harvard University (Cambridge, Massachusetts) in two sports games. One game was played with Canadian rugby rules, which allowed players to run with the ball, as well as throw it. The other game followed U.S. soccer rules, which restricted players to only kicking the ball. It seemed that Harvard preferred elements of both games and introduced them to Yale University in New Haven, Connecticut. Two years later, representatives from Harvard and Yale met in Massachusetts to create guidelines for this new game of football. Another new twist to the game was that it was played with an oval-shaped ball. Spaulding Sports Worldwide, based in Chicopee, Massachusetts, takes credit for having produced the first American-made football in 1892. In the early stages of the game of football, a pig's bladder was inflated and used as the ball. By comparison, today's football is an inflated rubber bladder enclosed in a pebble-grained leather cover or cowhide. This material is used because it is both durable and easily tanned. The football's uneven shape makes it difficult to catch and hold and also causes unpredictable bounces. White laces sewn on the ball's surface help the players to grip it. There have been many attempts to alter the football's design; for example, dimples on footballs have been tried, but there was a tendency for dirt and mud to get caught in them. is cut into a bend, which is the best and strongest part of the hide. The bend is then die-cut into panels. Using a hydraulically-driven clicking machine, an operator cuts four panels into the precise shape required at the same time. Next, each panel goes through a skiving machine in order to reduce it to a predetermined thickness and weight. A synthetic lining is sewn to each panel. The lining, which is composed of three layers of cross-laid fabric firmly cemented together, prevents the panel from stretching or growing out of shape during use. The lining and panel are sewn together using an industrial size and strength version of a home sewing machine. A facing is then applied to those areas that will carry the lacing holes as well as the hole for the inflating needle. The holes are then punched. The four panels are sewn together by a hot-wax lock stitch machine to ensure that the seams are especially durable. Then, the ball is turned right side out. Next, a two-ply butyl rubber bladder is inserted, the ball is laced, and then it is inflated with a pressure of not less than 12.5 lb (6 kg) but no more than 13.5 lb (6.1 kg). After inflation, the ball is checked to ensure it conforms to all size and weight regulations. The ball is ready for branding with the manufacturer's name and number. A two-ply butyl rubber bladder is inserted, the ball is laced, and then it is inflated with a pressure of not less than 12.5 lb (6 kg) but no more than 13.5 lb (6.1 kg). After inflation, the ball is checked to ensure it conforms to all size and weight regulations. After final inspections, the balls are boxed and shipped to designated schools and ball clubs. Since 1941, Wilson Sporting Goods Company, currently based in Chicago, Illinois, has been the official ballmaker for the National Football League (NFL). For all NFL games, the only sanctioned ball is a Wilson brand ball. The ball must measure 20.75-21.25 in (52.7-54 cm) around its middle (also called the girth, short axis, or belly); 27.75-28.5 in (70.5-72.4 cm) around its ends (the circumference, long axis); and 11-11.25 in (28-29 cm) from tip to tip (the length of the long axis). It also must weigh between 14-15 oz (397-425.25 g). All balls designed for professional use are stamped with "NFL" on them for the National Football League and they also bear the signature of the League commissioner. A box containing 24 new balls is opened before each game; 12 balls are put into play during each half. After the game, the balls are used for practices. Those balls that are used in the Super Bowl game also have the names of the participating teams along with the date and location of the game. 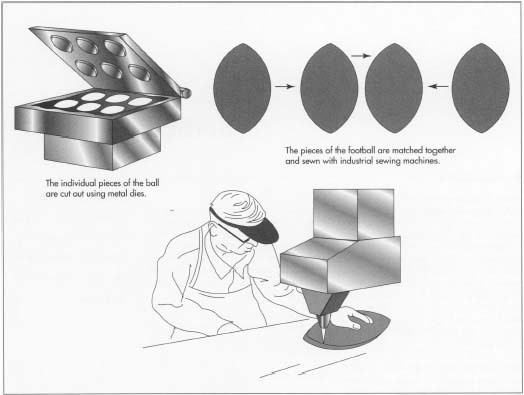 Future changes to the football are more likely to occur in the area of materials rather than design. The goal is to "create a better feel right out of the box." Spaulding Sports Worldwide currently is working on a proprietary material to create a composite-covered football. Two of the benefits of a composite cover compared with a leather cover are that it does not retain as much water; and that it is not as susceptible to becoming hard due to cold weather. Foehr, Donna Poole. Football for Women and Men Who Want To Learn The Game. National Press, Inc., 1988, pp. 94, 100, 101, 102, 127. Ominsky, Dave and P.J. Harari. Football Made Simple: A Spectator's Guide. First Base Sports, Inc., 1994, pp. 1, 9.